Thanksgiving is almost upon us. With the guest list finalized and all your favorite recipes organized, there is only one unanswered question: what to do with the turkey liver? Even people who love chicken livers view turkey liver as too much of a good thing. Whoever has the job of prepping the turkey on Thanksgiving Day frequently looks with bewilderment at the large double-lobed liver in the bag tucked ever so neatly inside the turkey. Following my mother’s lead, my solution is to turn lemons into lemonade or, in this case, turkey liver into pâté. My mother prepared chicken chopped liver using a shallow wooden bowl and a beat-up, double-handled, single-bladed mezzaluna knife that her mother had given her. She would cut up and sauté the liver with a chopped up onion. Two eggs would go into boiling water. Once hard-boiled, they would join the sautéed liver and onion in the wooden bowl, which she would hand to me along with the mezzaluna. While she prepared the chicken, she put me to work. As a 9-year-old, I would sit on a stool with the wooden bowl on my lap, rocking the mezzaluna back and forth, chopping up the livers and hard-boiled eggs. Periodically my mother would check on my progress and, when everything was reduced to a fine chop, she would retrieve the bowl, add melted chicken fat and mix everything together. 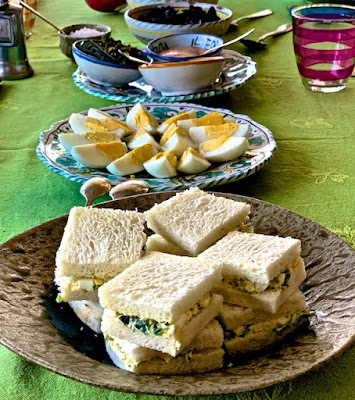 Just before our guests arrived, she transferred the chopped liver to a serving bowl and put it on the dining room table with a plate of saltines and the other appetizers, a platter of black pitted olives, whole radishes and vegetable crudités. I have adapted her recipe to use turkey liver. The result is the same. A creamy, tasty, fat-satisfying umami flavor. My mother liked her chopped liver rustic style. It is a matter of taste, but I prefer turkey liver when it is made with a food processor, creating a smooth pâté. To balance the richness of the liver, the pâté needs sweetness (caramelized onions), saltiness (sea salt), heat (black pepper) and earthiness (hard-boiled egg and mushrooms). Wash the uncooked liver and pat dry. Using a sharp paring knife, remove and discard all fat and membranes. Cut liver into half-dollar-sized pieces. Place the eggs into a pot of boiling water. Cook 10 minutes, remove from water, let soak in cold water to cool, remove and discard shells. In a large sauté pan over a medium flame, melt the butter and lightly brown the onions, mushrooms, parsley and garlic. Add the pieces of turkey liver and sauté until lightly brown, being careful not to overcook the liver, which should be pink inside. Season with sea salt and black pepper. Using a rubber spatula, scrape the sautéed liver and vegetables into a large food processor, add the hard-boiled eggs and pulse. Slowly add olive oil, a little at a time. Use the rubber spatula to push any accumulation off the sides of the mixing bowl. Continue pulsing and adding small amounts of olive oil until the pate is creamy. Depending on the size of the turkey liver, you might use more or less of the olive oil. Taste and adjust the seasoning with sea salt and pepper. Use the spatula to transfer the pâté from the food processor to a serving bowl. Cover with plastic wrap and refrigerate. The pâté can be kept in the refrigerator 1-2 days. Before serving, take the pâté out of the refrigerator, place on the counter out of the sun and allow to come to room temperature. Serve with crackers, toast points, fresh sourdough or French bread. Instead of Italian parsley, use 1 teaspoon finely chopped fresh rosemary leaves. For a denser pâté, use 1 hard-boiled egg instead of 2. Add ¼ teaspoon cayenne powder to the sauté for heat. Add 1 slice bacon, finely chopped to the sauté and brown until crisp. Add 1 teaspoon balsamic vinegar to the sauté. Sprinkle 2 tablespoons red onion or scallions, finely chopped, over the pâté just before serving.